Theotherrussia.org provides a full transcript of United Civil Front Chairman Garry Kasparov’s statement to US President Barack Obama. (Download the statement in PDF format). 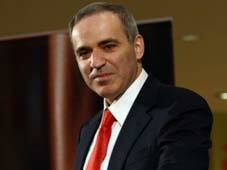 Kasparov was one of a handful of Russian opposition leaders to meet with Obama on Tuesday. Afterward, Kasparov gave this interview about his impressions of Obama and the meeting. Thank you, Mr. Obama, for meeting with us here today. It is odd that a meeting with the president of the United States is easier to achieve for most of us than a visit with the president of Russia. Those of us who oppose the current Kremlin regime have ever-fewer opportunities to express our opposition – not in our fraudulent elections, our state-dominated media, or even in the streets of Russia. I have spent considerable time in those streets in the last few years marching with thousands of others who want nothing more than to freely choose our own path. For expressing this basic desire they are called traitors and are beaten, arrested, and murdered. And yet when I travel in the West I often hear, even from high-ranking government officials, that Russians are lucky to be freer than we were in the days of the USSR. But we have crossed from a dark forest into a desert. Russia has been turned back on its road to democracy. Once again we have political prisoners in my country, a reality I once could not imagine. There is only grief when you must explain to your children why you are not ashamed of being arrested, and why their father is not a villain. Mr. President, your speech today was quite impressive, embracing the Russian people and distinguishing us from our current rulers. I assure you that the mainstream Russian opposition doesn’t see the United States as a threat. Anyone who considers Russia’s national interest – instead of their personal interests – realizes our real challenges, like yours, come from China and radical Islam. You and President Medvedev are both lawyers, both young, and perhaps have other things in common. But the leaders of this Kremlin regime has fundamentally opposing interests to those of the US as well as interests that directly oppose those of the Russian people you spoke so eloquently about, and no amount of common ground will change that fact. Prime Minister Putin and his friends have treated the Russian treasury like their personal bank, but only for withdrawals. They are selling the riches of our country from under our feet. In fact, if, President Obama, you wish to go down in history like Thomas Jefferson or William Seward, I’m sure you can get a good deal on several million acres of Russian land during your visit! You mentioned Honduras today, but here the opposition is taking lessons from another Latin American nation, Chile in 1988, where disparate groups banded together to win a referendum against the Pinochet dictatorship. We come from every part of the ideological spectrum, united only by a desire for free and fair elections and freedom of speech and assembly. Two days ago we hosted a meeting titled “Russia After Putin” to plan for that brighter future. There is a great deal of conjecture about the power structure of the government in Russia today, a terrible waste of time. What matters is that it is anything but a democracy. The Russian constitution describes three branches of government. Unfortunately, all three are now contained between the walls of Mr. Putin’s office. To all of President Medvedev’s talk of liberalization, I can say only that talk is cheap. We have seen no meaningful policy changes in the past year to indicate a new course. To the contrary, things are getting worse. President Medvedev has signed into being some of the most blatant anti-Constitutional practices of the so-called law enforcement programs. I have with me a partial list of recent victims of political oppression that I would like to leave with your staff here today. Unfortunately, even this partial list is quite long. A single case illustrates all the ills of the regime – political, economic, and judicial. That is the case of Mikhail Khodorkovsky and his company Yukos. Mr. Khodorkovsky and several of his colleagues have been sitting in jail for years for refusing to bend to Putin’s will. In 2005, you and your then fellow-Senators Biden and McCain submitted Resolution 322, expressing concern that the Khodorkovsky case was politically motivated, a violation of Russian law, and a demonstration that the Russian judiciary was not independent. Four years of continued injustice have proven your concerns to be completely valid. We still have hope despite these setbacks. Do not place Russia on a mythical list of countries that are not ready for democracy. No people on Earth deserve or desire to live under dictatorship. There were two Germanys, now there are two Koreas and two Chinas. The last few weeks in Iran should prove the final repudiation of the fable that some places are genetically resistant to freedom. Mr. President, you spoke today about a strong, peaceful, and prosperous Russia. This is also my dream. But today Russia is weak, uneasy, and, despite a decade of rising energy prices, still quite poor outside a select few. Only Russians can solve our crisis, and I believe that we will. And only a Russia freed from the fetters of our dictatorial regime can play the positive role in the world you described so vividly.